If you are a citizen of the European Union, wishing to retire in Italy, there is no need for an entry visa. Within eight days of arriving in Italy, you will need to register your presence with the local authorities, by going to the nearest police headquarters (questura) and applying for a residence permit (permesso di soggiorno). If you are a citizen from outside the European Union, you will require an entry visa to retire in Italy. This procedure will have to be undertaken at the Italian Embassy in your home country. You will need to be able to demonstrate that you have sufficient income to fund your basic living needs. This could, for example, be your pension. Within eight days of arriving in Italy, you will need to register your presence with the local authorities, by going to the nearest police headquarters (questura) and applying for a residence permit (permesso di soggiorno). There are different rules for people who have lived legally in Italy for 5 years continuously – for example as an employee/self-employed person or a pensioner. Such people automatically acquire the right of permanent residence in Italy. This right of permanent residence can be lost only if the person concerned is absent from Italy for a period of more than two successive years. Once you have acquired your permesso di soggiorno, you will need to acquire a certificato di residenza (residence certificate). This is an important document, essential for administrative procedures such as the purchase of a car, opening of a bank account, etc. This certificate is issued by the Anagrafe (Registry Office). 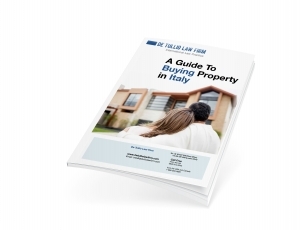 It can be obtained at your local town hall, and is considered a confirmation of really living where declared (in this case, your property address in Italy). Once you have a valid certificato di residenza, you will be able to obtain a carta d’identità (Identity Card) from your local town hall). Further information can usually be found by contacting the Italian embassy in your country. Any citizen resident in Italy is entitled to open an Italian bank account. In order to proceed, it is necessary to have a valid codice fiscale (Tax Code). Some banks also require a residence certificate – although it is not strictly compulsory. Generally speaking, to open an Italian bank account the documents you will require are your Tax Code, residence permit and a valid identity card. Italian bank accounts pay interest and charge some fees, both varying from bank to bank. Credit and debit cards are widely used and accepted throughout Italy. They can be used at ATMs and for payments in a wide range of businesses (restaurants, shops, and similar). A bank account holder is also entitled to use cheques, and also to operate a savings account. Since 2008, all cheques are issued as nontransferable, in effect as “account payee only” items unless expressly agreed otherwise in writing by the account holder and the bank.